Off-grid diesel generator powered sites, running continuously, cause glazing and carbon build-up in the generator engine and typically operate at an inefficient load range resulting in high fuel consumption. The UNIPOWER hybrid solution, by adding deep cyclic batteries, significantly reduces generator runtime and fuel consumption operational expenditure due to less frequent maintenance intervals. Cyclic batteries also provides a degree of operational redundancy in the event of generator failure as the batteries are only ever discharged to a limited capacity on any given cycle, thus eradicating the need for a second generator. Through the use of temperature hardened rectifiers and resilient batteries, the traditional requirement for air-conditioners can be traded in for a passive Heat Exchanger (HEX) or direct fan filter (DFC) cooling solution, both of which use significantly less energy. This energy saving equates to a lower total cost of ownership. Battery and generator management is handled through the UNIPOWER system controller, which, through the setting of battery type and capacity, ensures optimal site management and maximum lifetime of the battery and generator. The flexibility to expand using solar converters allows prioritized renewable energy to be integrated into the modular system design. Deployable using a wide range of existing indoor and outdoor power systems, the UNIPOWER Hybrid Solution is the latest in a series of energy optimization innovations that UNIPOWER is driving to help reduce total cost of ownership, while at the same time improving the environmental performance of mobile network growth worldwide. Deep Cyclic Batteries, with the capability to perform a large number of discharge and recharge cycles, are used to reduce the operating time of the diesel generator and improve operating fuel consumption. Batteries also store excess PV energy for deferred use. UNIPOWER carefully selects batteries designed for cyclic applications that provide a high rate recharge acceptance, high round-trip efficiency and high temperature resistance. Solar Photovoltaic (PV) panels supply renewable energy to the site. Featuring low operating costs and carbon free energy production these resources provide a valuable energy source for remote sites or carbon conscious clients. UNIPOWER Hybrid Controller HCX Advanced & Cyclic Controller HLX provide the essential function of managing battery and generator cycling through intelligent software controls; additionally HCX ensures maximum energy harvest of renewable energy sources. Fuel information from the generator is collected alongside battery and power data in order to provide complete statistics on the status and performance of the site. Site data is provided via alarm relays and a remote Ethernet connection. UNIPOWER Guardian AC/DC Rectifiers, fed by a Diesel generator or AC Grid, provide >95% conversion efficiency. Guardian rectifiers incorporate resonant technology to reduce component stresses, providing increased system reliability. They feature a wide input operating voltage range to maximize power availability within demanding utility power environments. UNIPOWER FPV30.48 Solar converters provide isolated power conversion for PV arrays. Maximum energy harvest from the valuable photovoltaic (PV) array is accomplished through high efficiency DC/DC power conversion (>95% peak) and Maximum Power Point Tracking (MPPT) algorithm. 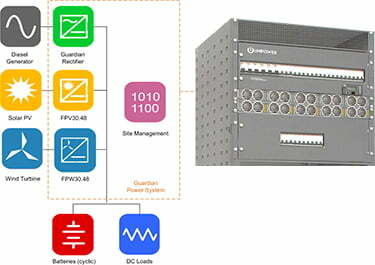 A Hybrid Bus Architecture allows many modern UNIPOWER Indoor and outdoor power systems the addition of a hybrid controller and optional PV converters transforming them into a full hybrid solution. 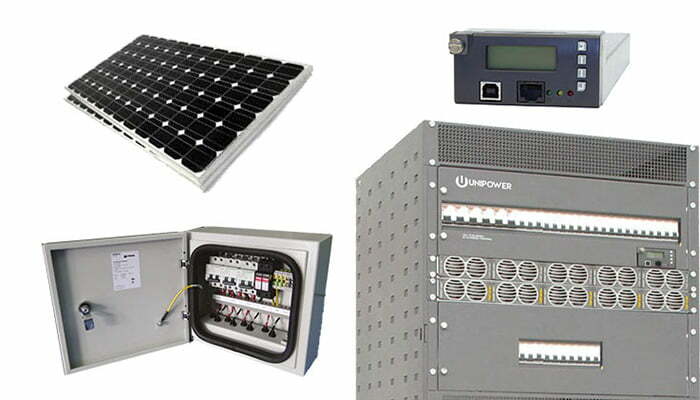 UNIPOWER Outdoor Cabinets provide protection and thermal management in a range of harsh outdoor environments. Cabinets include complete AC distribution and earth connection points and house the power system, DC distribution, system controller and provide space for mounting telecommunications equipment. UNIPOWER Hybrid Systems are also available as rack or Indoor cabinet solutions. Thermal Management: Low energy, passive cooling in the form of Direct Fan Cooling (DFC) provides extremely reliable thermal management for outdoor enclosures and shelters. Heat Exchangers (HEX) or AC and DC air conditioning are also offered in thermal solution portfolio. UNIPOWER Hybrid solutions are designed to minimize power system life-cycle costs and carbon footprint. Power conversion components deliver leading efficiencies and maximum energy harvest from renewable resources using MPPT algorithms. Hybrid Bus Architecture delivers available power from renewable resources supplemented by diesel generator or grid supply when necessary. Sophisticated controller logic monitors and maximizes battery life-cycle and minimizes generator runtime to provide best Total Cost of Ownership (TCO). Total site management and data logging provides detailed local and remote statistics.